I almost can't believe that i'm typing up my last favourites post of the year, and although December has been a hectic month it's one i've definitely enjoyed none the less. Initially I wasn't going to do a December Favourites, as I will also be doing an end of year highlights but the products within this post won't be featured in that post so I thought why not?! It wouldn't be right if I didn't do a final 2016 favourites post. Similarly to the majority of my favourites post this year, i'm keeping it quite minimal with this months favourites as the product I use on a daily basis don't really change all that much as i've streamlined the products I use a fair amount during the year, however I have been trying a few new products this month and a few i've been particularly enjoying, so I couldn't not share with you all. This year i've had a few amazing opportunities to work with Rimmel, of which i'm so grateful for and astounded by to this day as I never thought i'd have such an opportunity. A few weeks back they kindly sent me a lovely package with the party season in mind, which I featured a couple of products in my recent New Year Beauty Picks post and i've been particularly loving a few other products this month. Firstly i've been getting a lot of wear out of the Kate 022 Sculpting Palette* (£6.99), which i've wanted to try for some time after seeing a fair few raving reviews on it. I love the concept and idea behind this product, making contouring and sculpting easy in just three steps and i've enjoy the simplicity of this product. The shades within this palette are perfect for my skin tone and give a beautiful but build-able contour, blush and highlight. I also love the rose gold touches to this packaging of this palette, and makes a lovely prop for blog/insta photos! Another product i've been loving from Rimmel is their Wonder'full Mascara* (£7.99), which i've not tried a mascara similar to this before. It's flexible wand with soft bristles make it so easy to coat the lashes whilst giving an amazing amount of volume and length without coating the lashes with a clumpy coating that I find a fair few mascaras do. If you're wanting to try a new mascara i'd highly recommend giving this one a go. Moving onto a skincare item i've heard some amazing things about, and although i'm huge fan of Soap & Glory i've not tried many of their skincare products. Since recieving a lovely packagae from Soap & Glory i've been getting a fair bit of use out of their Speed Plump All-Day Super Moisturiser Marvel* (£13.99), which is a described as a full throttle attack on dry skin and as a sufferer of dry skin this sounds like just what my skin is in need of. I've been using this as my day moisturiser as it's fast absorbing and super hydrating formula sinks in, in time for me to complete my daily makeup in the few minutes I allow in a morning. It also improves the appearance of my skin, giving it a plump and healthy glow that it often lacks, and I just love what it does for my skin. Last for this favourites post is probably my favourite Christmas presents that my Mum kindly got me, and i've been wearing it to death ever since. 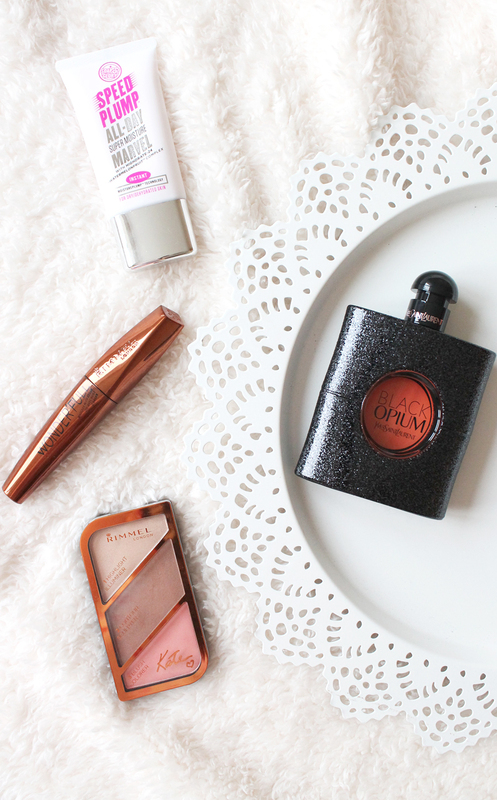 I've wanted YSL Black Opium Perfume (£42.30) ever since a fair few friends of mine raved about how much they love it! My choice in fragrance has changed over the past couple of years and although I still adore my Marc Jacobs scents, I also love a more rich mysterious yet still feminine scent and this perfume is just that, of which I absolutely love. So that is everything i've been loving for the month of December, and i'd highly recommend trying out these products! All in all 2016 has brought some beauty discoveries that i'll keep with me for years to come, and i'll be sharing some of my favourite discoveries of the year over the next couple of weeks.